Just in time for summer, this pie will make a great light snack or dessert. I am super excited about this pie! 2. It’s easy and quick to make – all you need is a food processor and a pie dish. No mess in the kitchen and only little bit of cleaning up. Blend all ingredients EXCEPT almond butter in food processor, until you get a sticky dough. Press this dough onto a pie dish, then spread a thin layer of almond butter over the crust. Place all ingredients into food processor and process until smooth. Pour on top of pie crust. Decorate the top as desired. 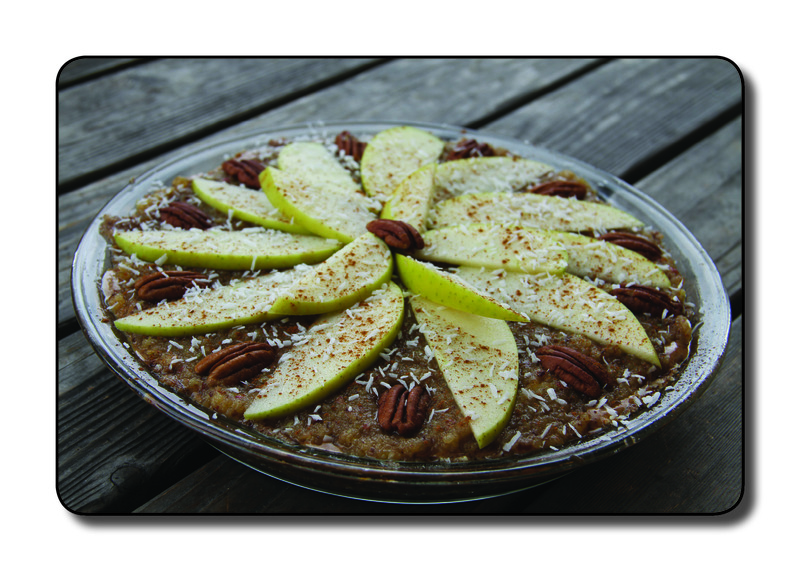 We used thinly sliced apples, pecans and shredded coconut. Chill in the fridge for couple hours and it’s ready to enjoy!